im in… whats the tune? are we allowed to use excuses such as ‘i was really busy teaching..ahem’? Don’t know what tune to pick yet. Could be a hard one or not. What do you reckon? A solo, maybe? a parker thing? too boring? a winkel number? dunno man the choices are endless! Hi from Derbyshire UK. This concept you speak of works very well. 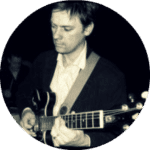 The contributors to the Usenet newsgroup nntp://uk.music.guitar have an annual event where we turn up to play with each other. In the preceding months, we build our song list here: http://www.ukmgnational.org.uk, and then practice like billy-o against the original recording. We get up on the night and deliver the goods unrehearsed. The results can be seen here: https://www.youtube.com/user/ukmusicguitar. We have just run our 2009 event and videos will be appearing shortly! That looks great! How many people do it? Having the deadline of doing the gig must be a good focus. You’ve given me some ideas too. I hadn’t thought about making it into a proper performance, was just thinking record something or video it. Will keep a lookout on your site/vids. About forty people have a go each year. They travel a fair distance to do it (from Scotland and the far sounth of England … one year a chap came over from Australia!). We make a weekend of it with a curry on the Friday, then an acoustic set on the Saturday afternoon, followed by the full-scale electric job in the evening. Loads of errors, mistakes and go-arounds happen, but it doesn’t matter. We all know that it’s a safe environment to screw it up!